As you may have heard, Lenny Zeltser recently released version 6 of his popular REMnux malware analysis Linux distribution. I’m a big fan of REMnux because it reduces some of the overhead associated with malware analysis. Rather than spending hours downloading software, installing tools, and navigating through dependency hell, this distribution gives you access and exposure to numerous tools quickly. Once you see the value of a tool for yourself, you can then dive into the code and configuration files to develop a deeper understanding of its inner workings and customize it to your needs. This is the first in a series of posts where I will highlight my favorite new additions to REMnux and why you should include them in your malware analysis process. One quick, effective approach to assessing a suspicious file is to capture a snapshot of system activity, execute the file, capture another snapshot, and then compare the two system states to determine the impact of execution. The popular regshot tool uses this approach to log registry and file system changes after an event like double-clicking malware. 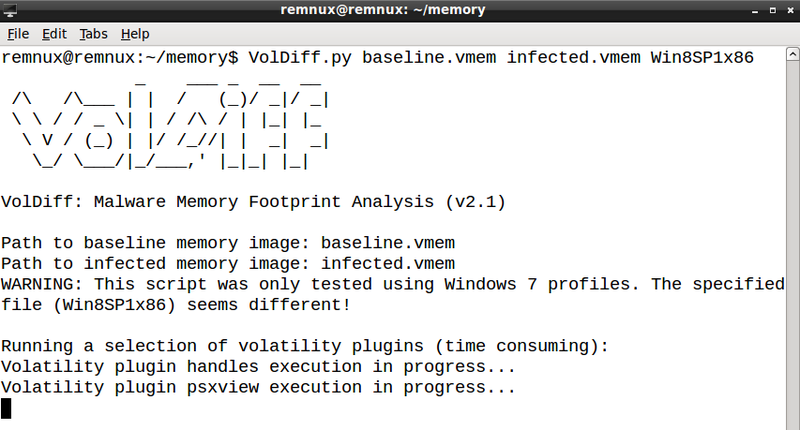 VolDiff, included in REMnux v6, allows us to perform similar analysis against memory dumps. Developed by @aim4r, VolDiff is a Python script that uses the Volatility memory analysis framework to analyze two memory dumps and output the differences between them. When applied to memory analysis, this script will focus your attention on memory artifacts generated after, and possibly as a result of, code execution. This can expedite your analysis of large memory dumps to detect activity such as code injection and provide visibility into packed or obfuscated code. However, keep in mind that memory is in a state of flux, so changes included in the diff results are not necessarily caused by executing the suspect file. VolDiff resides on REMnux in /opt/remnux-scripts/, but you can run it from anywhere since this location is included in the PATH environment variable. If you do not have the latest version of VolDiff (v2.1 at the time of this writing), you can update your remnux-scripts directory by running the commands sudo apt-get update and then sudo apt-get install remnux-scripts. Let’s explore the value of VolDiff with a malware sample. I used a file named funfile.exe, and if you want to follow along, you can download the sample here (password: infected). A few words about my test environment – since it’s advisable to perform malware analysis within a virtual machine, I used VMware Fusion. For this analysis, I started 1) a REMnux v6 VM with host-only networking and 2) a 32-bit Windows 8.1 VM with host-only networking. Within the Windows VM, I configured the Default Gateway and Preferred DNS Server with REMnux’s IP address. Lastly, I verified connectivity by pinging each host from the other. Note: If you dedicated more than a couple GB of memory to your Windows VMs, consider decreasing this value or you may be waiting hours for VolDiff processing to complete. accept-all-ips start: This bash shell script written by Lenny Zeltser redirects all network traffic destined for an IP address to the REMnux VM. inetsim: This tool simulates a variety of network services, including HTTP, HTTPS, FTP, and SMTP. If my suspect file expected to contact a web server, for example, I wanted it to do so to facilitate additional activity. I copied funfile.exe to the Windows VM desktop. I created a VM snapshot and noted the new “.vmem” file name on my host. In the Windows VM, I right-clicked funfile.exe and selected “Run as administrator” to execute the sample with admin rights. After giving the sample a couple minutes to run, I created another VM snapshot and noted this second “.vmem” file name. I then copied these files into REMnux for analysis. While there are several ways to do this, I chose to start the SSH server on REMnux and SCP the files into the VM. To ensure I did not confuse the two “.vmem” files, I renamed my baseline file to “baseline.vmem” and my second snapshot to “infected.vmem”. To kick off VolDiff against my two memory dumps, I ran the command shown below. Note that the command requires the correct OS profile for the memory images. VolDiff processed my 2 GB (each) memory images in about 45 minutes. 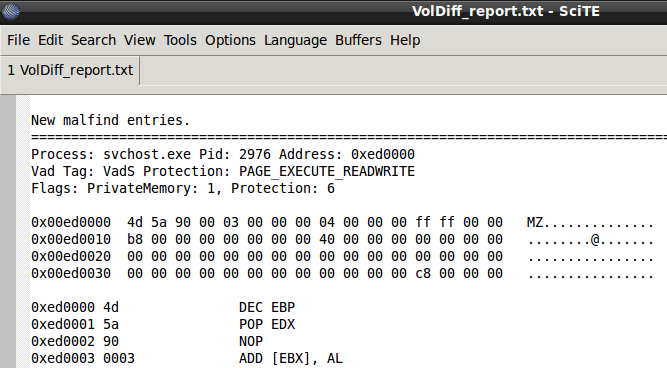 The result was a directory of output, but the critical file to review is VolDiff-report.txt. This file contained the key differences between the two memory dumps. My entire output file can be viewed here, but let’s discuss some excerpts. The output above shows new malfind results. The malfind Volatility plugin helps identify injected code, and in this case it discovered a suspicious memory segment within the svchost.exe process with PID 2976. Looking at the ASCII representation of the first few bytes of this segment, you may recognize the “MZ” string. This likely indicates we are looking at injected, executable code. It’s important to note that running malfind does sometimes result in hits even on a clean system; running the malfind plugin against my baseline image produced one hit. However, VolDiff’s diff operation focused my efforts only on new activity. The output above shows new netscan entries. The netscan Volatility plugin locates network artifacts in memory. Running this plugin against my “infected.vmem” alone revealed 57 connection artifacts. Since VolDiff highlights changes in the victim system’s state, it trimmed my analysis data set to only two connections, one of which I have included above. This output clearly shows that the suspicious svchost.exe (based on malfind output) established a TCP connection over port 443. In this case, VolDiff indicates that the svchost.exe is running in an unexpected session. Session 0 is reserved for system processes and services, and a legitimate svchost.exe process should be running in that session. However, the svchost.exe with PID 2976 is running in session 1, which is associated with a user session. In this way, VolDiff goes beyond simply diffing two memory snapshots and includes built-in heuristics to identify potential malicious activity. At its core, this is an even more powerful diff operation, because it relies on certain absolutes (i.e., a legitimate svchost.exe always runs in session 0) and makes no assumptions about the state of your baseline image. In case you’re wondering, this sample has a 39/53 detection rate on VirusTotal. Microsoft identifies it as a Win32/Tofsee variant, a spambot that is commonly spread via email. As we suspected, it launches and injects executable code into svchost.exe and attempts to connect to IP addresses for command and control. Diffing two system states is a powerful malware analysis technique because it shines a spotlight on new activity. VolDiff, included in REMnux v6, uses this approach to focus your analysis on memory artifacts most likely associated with code execution. I encourage you to explore this and other REMnux v6 tools on your own, or join me at the upcoming FOR610 Reverse-Engineering Malware course in Virginia Beach this August. Interesting that the netscan output showed the established connection. I thought when you take a snapshot VMWare is supposed to run some clean up scripts, clearing network connections on the assumption that the remote host may not be available when the machine is resumed, or so I’ve been warned. I was considering capturing with more traditional tools ( probably winpmem or even ftkimager), but the proof is in the pudding; it didn’t seem to affect you. Maybe i was given the wrong info, or it applied really suspending or shutting down. I guess I should test before accepting recommendations. Thanks for the comment. In my experience, network connections are cleaned up when the VM is suspended, not when a snapshot is taken.